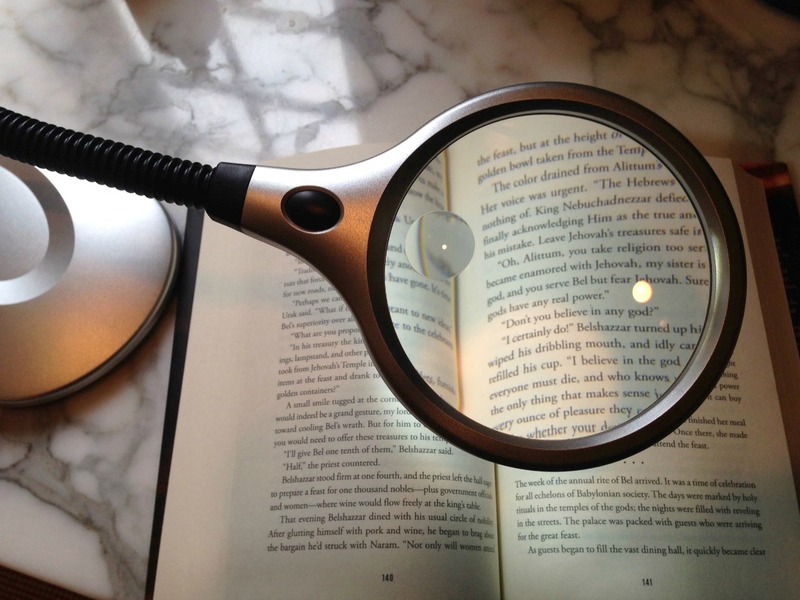 A book magnifier comes in different shapes and styles. Determine first where you like to read. Perhaps it's your favorite reading chair, in your bed or at your desk. Where you like to read will make a difference as to what reading aids will be most helpful to you. By simply getting a brighter light or changing the type of light you use can make a big difference. Less magnification is needed when proper lighting is available. Use brighter bulbs and lamps that can be adjusted so that the light is directed onto your reading material. Use one that has not only an adjustable height but pivot points to direct the light onto your book page. You can purchase just about any book you want in large print. Not only do large print books have larger fonts, they have more space and better contrast. Some books are printed on special paper that have no glare. I can't explain why large print books are so much more expensive than regular books - but they are. Our local library carries a large selection of books in large print. 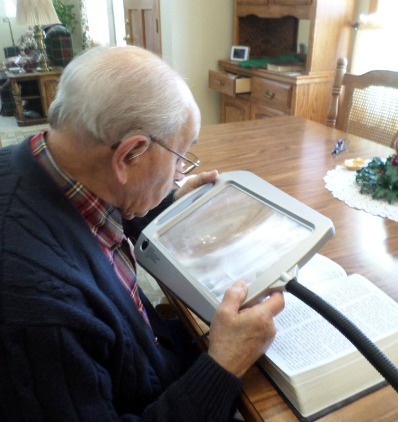 My father-in-law who has wet macular degeneration finds that reading is easier when he combines a large print book with bright LED lighting and a full page magnifier. Amazon has more recently become my source for buying books. Over 200,000 titles of large print books are available from Amazon. Click here and it will take you to their section of large print books. Amazon also lists used books, so you can purchase used large print books much cheaper than the new ones. These magnifiers come in many styles and they are often inexpensive - there are dome magnifiers for gliding over a newspaper or floor lamp magnifiers to have near your favorite chair. You may want to have a couple of different reading magnifiers for different reading material. Sometimes you just have to try a couple of reading magnifiers to find the ones that work best for you. A magnifying floor lamp provide a hands free magnifier that allows you to read for an extended period of time without having to hold a magnifier. 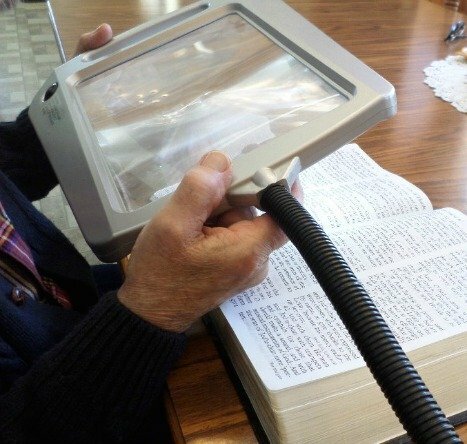 The magnifier is large enough so that a full page is magnified making it easier to read books, magazines or the news paper. This is the reading magnifier my father-in-law uses. He loves the bright LED lights and the adjustable arm. Place a stand magnifier over your book so that the full page is magnified. This book magnifier offers a high quality distortion free lens with 3X magnification. The generous size of the lens measures 7.5" X 10" so you can view an entire page. There is no need to hold a magnifier at just the right distance to get crisp, clear wording. It is fully adjustable to any angle. Use it to read books, magazines or the newspaper. A magnifying desk lamp that can be adjusted like the one pictured offers 2x magnification with a spot lens of 5x. Two very bright LEDs light up the lamp using an AC/DC adaptor or with 3 AA batteries so you can use it anywhere. 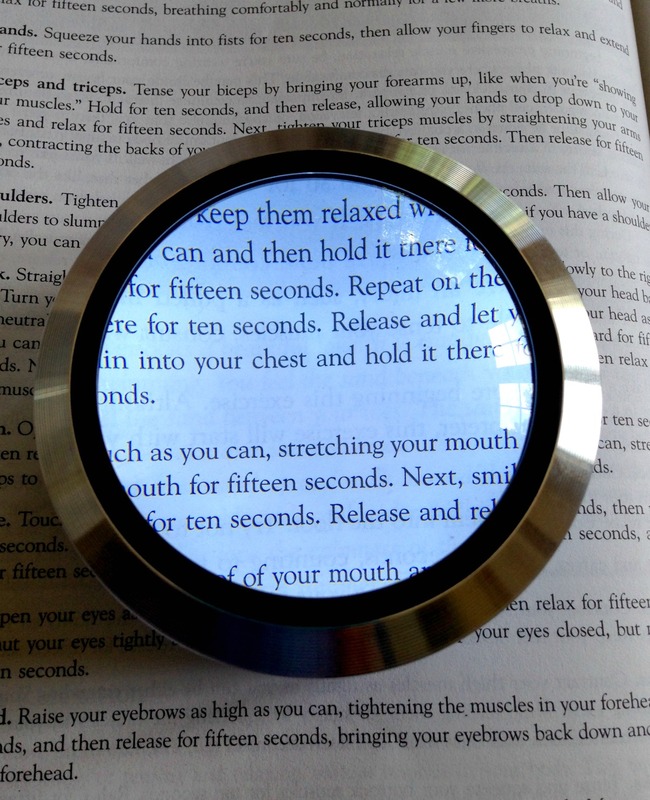 Dome magnifiers are an ideal book magnifier for reading at your desk or at a table. They work well for reading books, newspapers, maps and magazines or for hobbies like stamp and coin collecting. They are also helpful just for reading bills or documents. Resting directly on your reading material, they glide easily across any surface. An electronic reading device like the Kindle Fire HD provides the option of font magnification with clear, crisp words with the ability to adjust the contrast. The color Kindle reader called the Kindle Fire is great for enjoying books as well as magazines that use lots of photographs such as National Geographic, Better Homes and Gardens or recipe books. With an ebook reader you can turn every book into a large print book. This book magnifier has 8 different font sizes. You can download free Kindle books like War and Peace or Pride and Prejudice. Did you know that you can also download audiobooks right to the Kindle reader? Simply plug in a headphone and listen away when you get tired of reading. 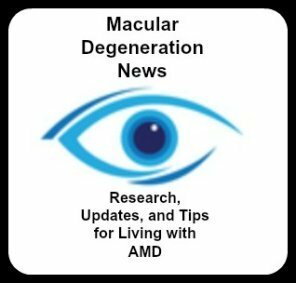 As your macular degeneration progresses continue to enjoy reading by combining reading aids like a large print book, a book magnifier and direct lighting. My father-in-law finds that the combination of a light, magnification and large print makes it possible for him to continue reading. He will read either a large print book or his e-reader set to the largest font combined with a floor lamp magnifier when any of these aids by themselves would no longer work for him.